Due to the popularity of Tea Lights and Candles, we are delighted to introduce our new line. Since our Polar Bears have had such an overwhelming response we have taken our couple and set them in a wonderful winter landscape. The Polar Bears can be personalized on the stars and the year could be put on the front of the snow. Sure to "light up" your life! 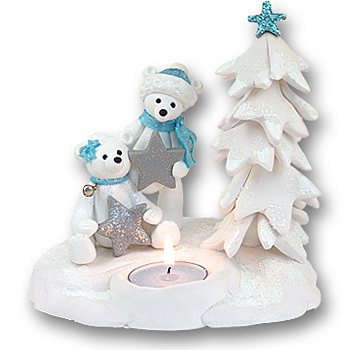 This Tea Light /Candle is hand made from polymer clay and lovingly designed by Debi Allison.